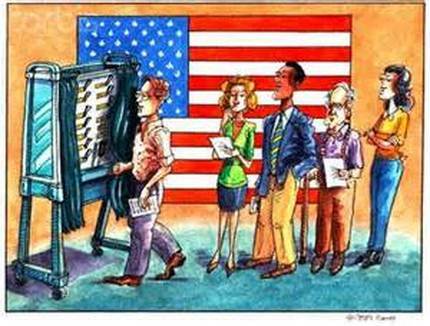 Voting is a right and a civic responsibility . . .
Do your part for good government by registering to vote, becoming informed, and voting! How to Register or Update Your Voter Registration. Click on the form to the left to open a new window with the complete form (in pdf format). Complete the entire registration form. Remember to check the box next to the political party in which you wish to enroll. If you do not wish to be affiliated with any party, check the appropriate box. Sign and date your registration form in blue or black ink. This is required! 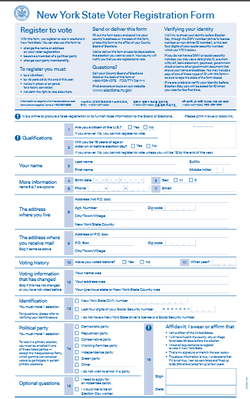 Mail (do not fax) the completed registration form. Note: This address is for Monroe County residents only. Click here to visit the Monroe County Board of Elections website. Name, address or party enrollment changes can be made by submitting a new registration form in any manner permitted for a registration application. 20 days before the election in which you seek to vote. If you have missed the 20 day deadline, you may contact the Board of Elections for your new polling site where you will be allowed to vote on a paper ballot.